The peaceful predawn hours are a special time of day, particularly if you’re fond of donuts. It’s also an ideal time to visit a Little Free Library. I had the good fortune to bring together the indisputably perfect combination of donuts and books while vacationing in the lovely city of Savannah, Georgia, recently. 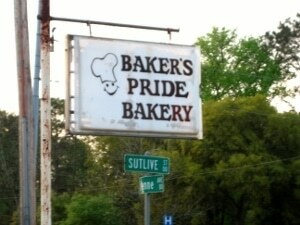 Having been assigned the mission to seek out the finest bakery on the Georgia coast, I used a combination of dead reckoning and good luck to find the Baker’s Pride Bakery on the outskirts of Savannah, just down the road from Herschel Vespasian Jenkins High School. While I can personally attest to the fact that America is blessed with many great bakeries from sea to shining sea, I have to say that the blueberry fritter I so wantonly consumed on this particular April morning may be the finest baked good I’ve ever had the pleasure to devour. But enough about the donuts, although the cream-filled chocolate bismarck was also spectacular. Having secured a large stash of delicious baked goods for my still snoozing family, I headed back toward the historic downtown, planning to stop at a Little Free Library on the way. Maybe it was the car full of distracting sugary delights or maybe I was a bit sleep deprived, but it took me a while to finally zero in on a library in a quiet residential neighborhood, disturbed only by the occasional raucous mockingbird. The library was easy to spot on the lawn, vibrantly decorated in front of a quaint brick house and a fully bumper-stickered Subaru wagon. Inside I found a pleasingly diverse selection, spanning centuries and including such luminaries as Christopher Marlowe, George Orwell and the late great humorist Art Buchwald. Plenty of popular fiction was present as well, from David Baldacci and James Lee Burke to Anita Diamant and Larry McMurtry. Always on the lookout for quality non-fiction, I selected The Fatal Shore, an acclaimed history of the founding of Australia by Robert Hughes. Ironically, having passed on books by Stephen Ambrose and Greg Mortenson, I had the perfect author to join the pair in Farley Mowat, a popular author who has also been accused of having problems distinguishing between fact and fiction in his books. With my contribution of Mowat’s The Siberians, it appears that this library is developing a bit of a theme. After quietly closing the library, trying not to wake anyone, I hopped back in the car and managed to find my way back to the hotel just as the sun was rising, well loaded with sugary goodness and fine writing. Another successful Little Free Library adventure in the beautiful birthplace of the one and only Peach State.